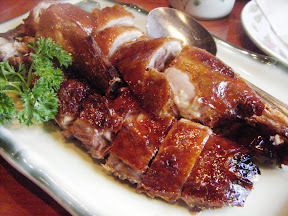 Shanghai soup dumplings and an $8.50 “appetizer” portion of BBQ duck at Macky’s in Issaquah. 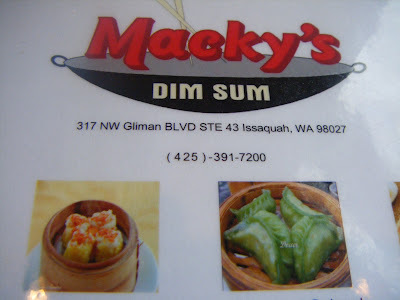 Seek and ye shall find: Macky’s house of dim sum (formerly the Sweet Addition), in Gilman Village. So, what’s with that name? Blame it on Issaquah resident Macky Wong. If the name doesn’t sound familiar, maybe the face will. 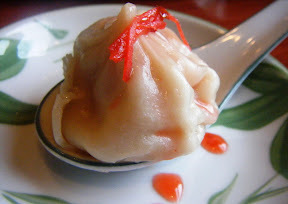 Macky and her husband Sonny owned the Chinatown/International District dim sum favorite China Gate for 20 years before selling it in 2008. 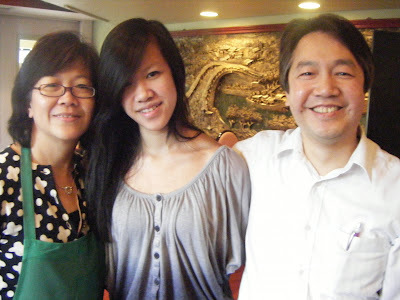 Macky (left) and Sonny Wong, late of China Gate, flanking their daughter Karri. Between now and then, the couple owned and operated Vegetarian Bistro in the ID (since shuttered), and here in Gilman Village they’ve partnered with Ballard boy Steve Katsandres, owner of Bad Albert’s Tap & Grill. Steve and Sonny met “years and years ago,” Steve told me this morning. 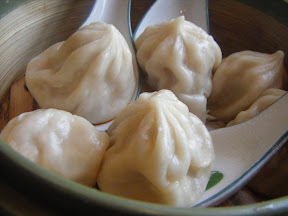 Back then, Bad Albert’s badman was a saute-cook at Schwartz Brothers Benjamin’s restaurant, and in the decades since he’s downed his share of dim sum at China Gate. “We always talked about doing something together,” says Steve, who helped design the kitchen and dining room at Macky’s. 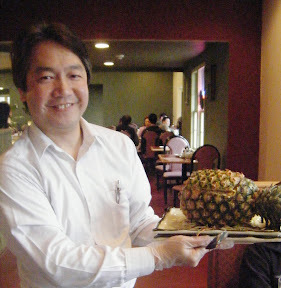 He also put his head together with Sonny to devise an East-meets-West menu. Helping them all in the kitchen is “Mr. Fook,” late of China Gate, who cooked for the Wongs for 15 years before working the woks here where the menu remains a work in progress. 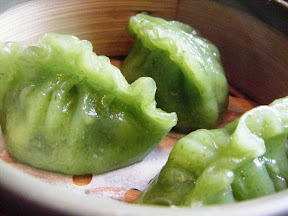 Sui mai, shrimp and vegetable dumplings and steamed spinach dumplings. 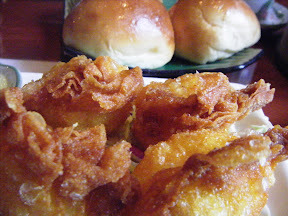 Fried shrimp dumplings and BBQ pork hom bao (left), Shanghai-style steamed soup dumpling. 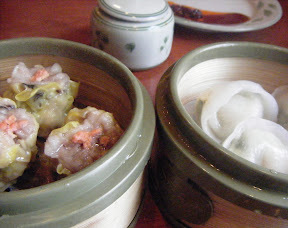 Name aside, dim sum is not the sum of Macky’s parts. Among the other specialties? A whole Kabocha squash, stuffed with curried seafood. 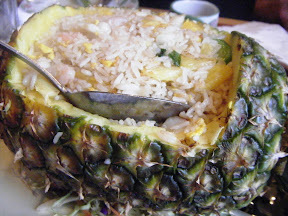 And fresh pineapple, borne to the table before it flips its lid to show off a mix of fresh fruit and seafood, delicately fried with rice. “Try it, you’ll like it!” says Sonny, and next time have the stuffed pumpkin! I’m certain there will be a next time. So there, Anne. 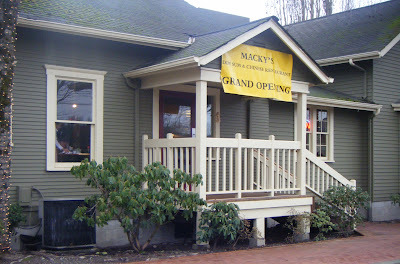 I’m with you: Long live Macky’s, now open daily (Monday-Friday 11 a.m-9:30 p.m., Saturday 9:30 a.m.-9:30 p.m. and Sunday 9:30 a.m.-9 p.m.) See you there.